High State Council head Abdulrahman Sewehli has laid into the Rixos coup plotters saying that they were not the revolutionaries (thurwar) they claimed to be. “The real revolutionaries are there in Sirte,” said Sewehli, “sacrificing their lives to save Libya from terrorism”. He was speaking at a joint press conference with UNSMIL chief Martin Kobler who had come to see him at his temporary HQ at the Radisson Mahari hotel. Sewehli said that the Rixos coup plotters were merely a minority who represented only their own interests and lacked public support. He said that the stability and security of the capital would not be sacrificed by an open confrontation with the plotters. 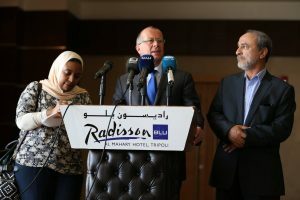 Kobler had arrived in Tripoli as had the new French ambassador to Libya Brigitte Curmi. They had separate talks with Presidency Council chairman Faiez Serraj at the Busetta naval base. They later went on to individual meetings with two ministers-designate, Colonel Mahdi Al-Barghathi at defence and Mohamed Siala, foreign affairs as well as the head of the PC’s presidential guard Colonel Najmi Ramadan Khair Al-Nakua.